Creative Minds Foundation (C.M.F.) is a socio/philanthropic organization set up in May 1989 by Dr. E.O. Omanukwue and Mrs. A.C. Omanukwue − De Man. It was incorporated under the land perpetual succession Act Cap 98 Laws of the Federation of Nigeria 1990. Concerned by the deteriorating quality of education in this part of Nigeria, Creative Minds Foundation set up the Nkisi Comprehensive Schools with 25 children admitted in the nursery/primary in 1989 at 66 Niger Drive G.R.A. Onitsha. 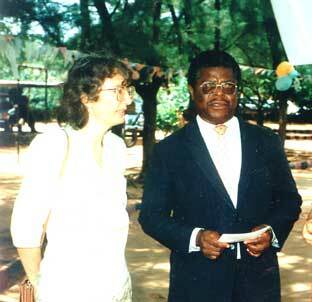 In January 1990 Creative Minds Foundation moved the Nkisi Comprehensive Schools to Nr. 6 Park Road, G.R.A., Onitsha until July 2017, after which it moved to its present location at Nr. 1 Okolo Street / Nkisi-Otuocha Road, Oyolu Oze-Nkwelle Upper 3-3 junction, Oyi L.G.A., Anambra State, Nigeria. Dr. & Mrs. E.O. Omanukwue are the first Trustees of the foundation. Creative Minds Foundation is also under the Trusteeship of Creative Minds Limited. The Nkisi Comprehensive Schools are made up of the kindergarten/nursery or pre-school (between one and a half years and 5 years), the primary school (between 5 years and 11 years) and secondary school (between 11 years and 17 years). This means that children, who are admitted into Creative Minds Foundation from the tender age of about one and half, are programmed to pass through the three stages until they are seventeen years of age or thereabout after successful completion of their senior secondary education. The classes in nursery, primary and secondary schools are arranged according to individual performance and I.Q. A unique and special diary and file systems are operated in both the primary and secondary schools for individual communication and continuous assessment of our pupils. This means that that every pupil from the primary level must have his/her personal diary, specially designed by the school. The diary must be signed on daily basis by the parent or guardian. The diary is a medium of direct communication and serves as control for all - the child, school authorities and parents/guardian. The graphed individual continuous assessment file - fortnightly basis, and diary - daily basis, show at a glance the status of any Creative Minds Foundation child for the duration of a given period including examinations. The school rules and regulations cover expectations for good behaviour. All pupils are required to abide by a code of conduct similar to those normally expected in various communities. After school care is available until 6.00p.m. for parents whose work arrangements make it difficult for them to collect their children earlier. Creative Minds Foundation Schools act as good parents to the children. Every parent and/or guardian desirous to get his/her ward admitted into Creative Minds Foundation Schools is invited to a face to face interview with the school management, led by the foundation principal or her accredited representative.